Always enjoy a fresh cup. Brew a perfect cup of coffee, tea, hot cocoa or iced beverages at the touch of a button. Designed for medium-size businesses with up to 40 people, this fully programmable brewer features an interactive LCD touch screen that allows customizable brew temperature, auto on/off, language settings and a choice of five cup sizes (4 oz., 6 oz., 8 oz., 10 oz. and 12 oz.). Choose from English, Spanish or French. 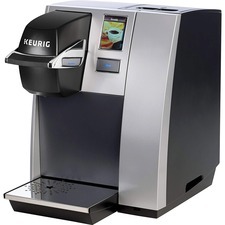 With a plumbed water source, it allows back-to-back brews in less than a minute with convenient K-cups. Removable drip tray accommodates travel mugs. The K150P Commercial Brewing System also includes a drainable, internal, hot water tank for transport or storage. It is also NSF certified for use in foodservice outlets.